The latest large planning application at the Elephant will provide zero affordable housing and zero social rented housing. It is for Skipton House, behind the Bakerloo line tube entrance and it joins Eileen House, Strata Tower, Tribeca Square, 360 Tower and One the Elephant in the ongoing efforts to turn the Elephant into a social housing free zone. The application is for 50,000 sq metres of offices, shops and 421 residential units. An art house cinema is also proposed, as part of the ‘cultural offering’. Developer London and Regional Properties (L&R) obviously believe this will compensate for not providing homes that anybody can actually afford to live in. They say that ‘The level of affordable housing that could be delivered in conjunction with the Development, and its cultural offer, will be determined through discussions with Southwark Council and the submission and appraisal of a Financial Viability Assessment’ (Draft S106 Heads of Terms) . This is very gracious of L&R, but ignores the well-known requirement for 35% affordable housing, half of which should be social rented (Core Strategy Policy 6). This would give us about 150 affordable units, 75 of which would be social rented. Instead, L&R propose to make a payment of £16.8m in lieu of providing any affordable housing, so that their site will be left unsullied by anyone who cannot afford what they estimate will be an average £820k price tag for a new home1. This represents a pitiful 2% of the estimated total development value of the completed development (£747m). The Council claims that the £16.8m in-lieu payment represents the equivalent of 20% affordable housing but hasn’t explained its methodology behind this calculation. Were the Council to use its standard £100k per habitable room tariff for in-lieu payments; this in-lieu payment would have amounted to £47.8m2 - much more than the paltry £16.8m offered. The planning committee report says that the Council’s appraisal of the applicant’s viability assessment disagrees with some of its assumptions. The Council’s appraisal estimates that the developer has overstated build costs by £51m (14% - see para. 75). 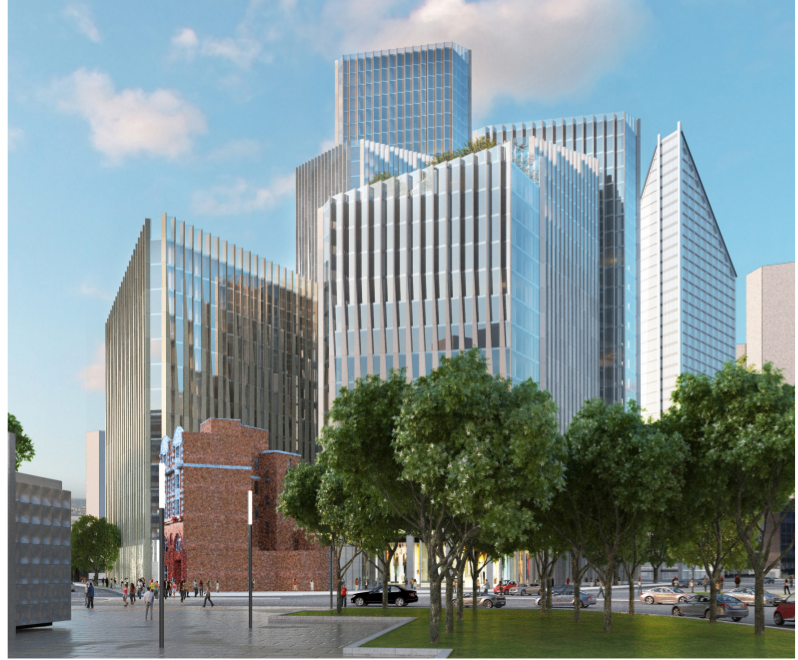 There is also a disagreement about the viability benchmark: the developer has estimated the Existing Use Value of the Skipton House office building at £120m, despite having paid just £54.5m for it. The Council says that there will be viability review once the development is implemented but concedes that further payments in-lieu of affordable housing will only be made once L&R has made a minimum 17.5% profit. This 17.5% developer profit margin has been ring-fenced in the viability assessment, representing a guaranteed windfall of £130m for the developer, regardless of how much affordable housing is provided3. L&R support their argument by claiming that the development is one of ‘exceptional circumstances’. L&R also trot out the well-worn argument that providing affordable housing means building a separate core (providing what’s become known as ‘poor doors’) which in turn would ‘reduce the efficiency of the Development and ultimately the overall viability.’ If this is not sufficient to convince Southwark to give up hope of any on-site affordable housing L&R adds another developer favourite, that ‘the proposed strategy for the inclusion of the large communal residential terrace……would also need to be reflected in service charges for any affordable rented units’ (Quotes from Planning Statement). L&R’s use of the market value as benchmark is also a clear breach of the Mayor’s SPG guidance on viability testing, which clearly states that the existing use value must be used, which ‘excludes any hope value’. Southwark’s expert consultant questioned L&R’s use of market value as the benchmark and also L&R’s claim that only a maximum of £16m was available for affordable housing; he came up with a much higher figure - £67m4. However, the planning committee was easily persuaded to settle for the lower figure by the promise of a viability review, after development has started, which might get further payments for affordable housing, if, amongst other things, residential and office values rose and building costs fell. When the Greater London Authority (under Boris as Mayor) was consulted on L&R’s original application, it noted that there was no quantified affordable housing on offer and reminded both Southwark and L&R that ‘the applicant is to prioritise on-site delivery as a first principle’ (GLA Stage 1 referral 29). However, by the time it came to the final stage 3 report, Sadiq Khan had replaced Johnson as Mayor and issued his approval to the scheme, noting only “I wish to emphasise that the low level of affordable housing in this case is only acceptable due to a unique set of viability circumstances and wider proposed public benefits”. We note the significant departure from Sadiq Khan’s original election manifesto pledge to take a ‘tougher stance with developers’ and their viability assessments, and ensure that every development delivers at least 50% affordable housing..
On a local level all of Southwark’s Labour members on its planning committee voted as a block in favour of the development. The Lib Dem councillors Adele Morris and Hamish McCulloch voted against. Local Cathedral ward councillor David Noakes also spoke against the application. L&R acknowledge that they risk a planning refusal should a homeless hostel be lost ‘where it meets an identified local housing need’ but Southwark comes to their rescue, with the council reportedly ‘prepared in principle to relocate the Hostel elsewhere within the borough to continue to meet an identified local housing need’ (Planning Statement 8.10-8.12). We can only conclude from this that Southwark believes that either we don’t have a local homelessness problem at the Elephant, or that the need can be met by a hostel elsewhere in the borough. Council housing data shows a staggering 92% increase in homelessness applications last year. Notwithstanding L&R’s cultural ambitions, the 500 seat cinema has been replaced with a 350 seat performance venue in the revised application, with a wish list of uses (Planning statement 4.12-4.15) - the consequent reduction in size is what allows the increase of affordable housing from 0% to 15%, according to L&R. But L&R’s cultural vision is not shared by several statutory consultees. These bodies must be consulted about the application and are thought to be best qualified to judge its merits, including its cultural worth. The Twentieth Century Society has objected to the development’s over-sized massing and warns that it could “cause harm to the architectural significance” of the neighbouring Goldfinger-designed Metro Central Heights. 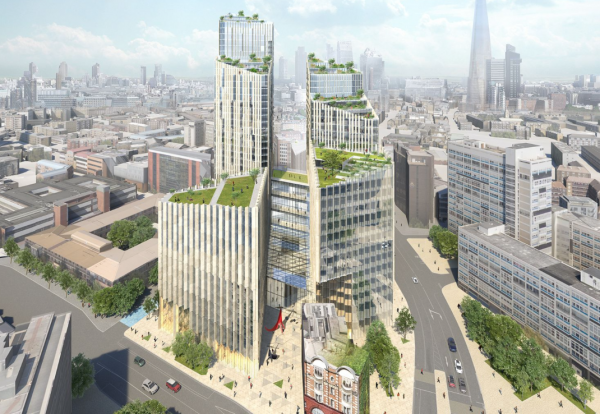 Historic England have also objected saying that “the proposed tower will have a harmful impact upon the settings of conservation areas and listed buildings” in the local area and views from the Westminster World Heritage site. Our blog post report would not be complete without some account of L&R. In 2012 The Evening Standard reported that the company is owned by “secretive” brothers, Ian and Richard Livingstone, who “have built up a global empire with combined assets worth more than £4 billion”. They bought commercial properties in the early nineties and and made ‘their first big fortune’ in 1993, when they sold their portfolio for £93m. They “registered their master company, Strategic Properties Ltd, on the offshore tax haven of St Kitts and Nevis” (the Standard adds ‘there is no suggestion that they tried to avoid paying British taxes’). The Telegraph reports that the brothers like to pay themselves hundreds of millions in dividends each year; Companies House data shows that L&R hasn’t paid any UK corporation tax since 2010 (when it paid just £1.9m); we note an office in Panama. L&R joins the list of other developers at the Elephant with offshore links and we note L&R is also one of the top 100 Tory party donors - as is Delancey’s Jamie Ritblat.